A fast drying adhesive that develops strength quickly. Has excellent heat resistance; temperature performance range is from (-5°f to 300°f) -21°c to 149°c. 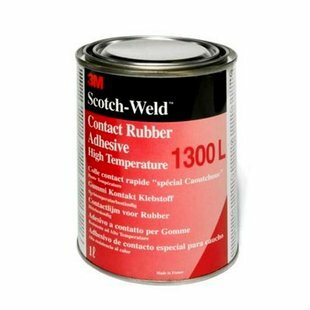 3MTM Scotch-WeldTM Neoprene High Performance Rubber & Gasket Adhesive 1300Lis the most versatile of our rubber and gasket adhesives. It may be used to bond metal, wood, most plastics, and neoprene, reclaim, SBR, and butyl rubber.